Collaborative oncology care, which involves incorporating an advanced practitioner (AP) into an oncology practice, will help meet the growing burden of complex care and improve patient satisfaction. Collaborative care is also cost-effective, and oncologists report increased professional satisfaction when an AP is part of their practice, said Wendy H. Vogel, MSN, FNP, AOCNP, Wellmont Cancer Institute, Kingsport, TN. Ms Vogel discussed the role of the AP in providing advanced oncology care to the community. There are an estimated 11,000 APs in oncology in the United States, including nurse practitioners, physician assistants, clinical pharmacists, and clinical nurse specialists. Practices for each type of AP vary, and there are several practice models. The most important concern for APs in oncology care is being able to practice in a supportive, nonrestrictive environment. The mentoring and support of physicians in the practice are key components of professional growth and satisfaction. “Collaborative care is essential to meet the demands of increasingly complex oncology care and the shortage of oncologists, which is only going to get worse,” Ms Vogel told attendees at the 2016 American Society of Clinical Oncology (ASCO) annual meeting. “In some practice models, the AP is not utilized to the full scope of practice, and there is redundancy of services. Barriers to a full practice include autonomy restrictions and insufficient support,” she emphasized. The majority of APs are trained in general practice, with limited time devoted to oncology. One survey of APs showed that it required 1 to 2 years to become fully competent in oncology. In this survey, nurse practitioners and physician assistants indicated that physician mentoring was the most important aspect of their oncology training, and self-study was cited as the second most important component of oncology training. “Unfortunately, most of the oncology training happens on the job,” Ms Vogel said. Several organizations offer oncology education to APs, including the Association of Physician Assistants in Oncology, ASCO, the Advanced Practitioner Society for Hematology and Oncology, the National Cancer Institute, and the Oncology Nursing Society. It is difficult to manage and assess AP productivity, Ms Vogel continued. Adequate productivity measures for APs are lacking, and using relative value units (RVUs) underestimates the value that APs bring to the practice. The measurement of productivity should include individual RVUs, as well as team-based RVUs. To ensure productivity, the AP must be able to work at the fullest legal scope of practice and as independently as possible, Ms Vogel said. She encouraged attendees to work at the state level to change restrictive practices for APs. 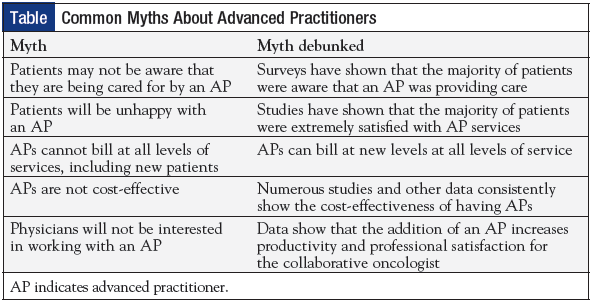 Ms Vogel also called on attendees to debunk common myths about AP practices that prevail in the medical community, including the myth that patients may not be aware that they are being cared for by an AP (Table). Integrating an AP into the healthcare team takes time and deliberate planning, Ms Vogel said. The measurement of productivity should include value-added functions that may be nonrevenue-generating, patient satisfaction, and professional satisfaction. Thoughtful scheduling of patient visits will enable oncologists to offer new patients rapid access to AP services. 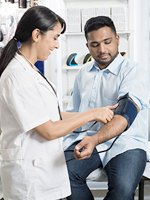 Planning for urgent care will decrease the use of emergency department services, thus increasing patient satisfaction. “Adequate training and mentoring of the AP will enable the highest level of productivity in the timeliest manner. This will lower the burnout rates and increase professional satisfaction. Ongoing education is critical for the AP to stay current in this rapidly changing field,” Ms Vogel said.